Jeff Peng, Associate Professor of Chemistry and Biochemistry with a concurrent appointment in Physics, was recently elected to the Executive Committee for the annual Experimental NMR Conference (ENC). In April 2018, a delegation from Notre Dame visited with colleagues from the Pontificia Universidad Católica de Chile (Católica) in Santiago, Chile. 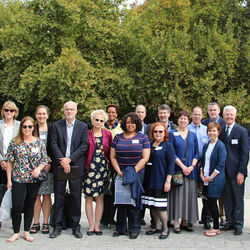 The trip was led by Mary Galvin, William K. Warren Family Foundation Dean of the College of Science; and Peter Kilpatrick, Matthew H. McCloskey Dean of the College of Engineering, and included faculty and advisory council members. 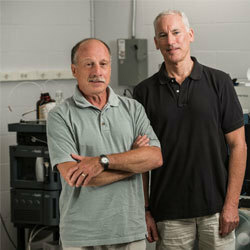 Galvin and Kilpatrick sought to engage in dialogue with peers, exchange ideas, and create pathways for collaboration between scientists and researchers at both institutions. A study by researchers at the University of Notre Dame and the University of Missouri at Columbia shows in mice that early administration of a potent compound may increase the window of time in which some stroke patients can receive tPA, a therapeutic that dissolves blood clots. 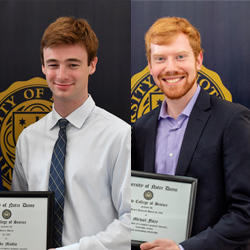 All are welcome to attend the Harper Cancer Research Institute’s (HCRI) fourth annual open house on Wednesday, June 20, from 4:00 p.m. to 6:30 p.m.
On Friday, May 18, 2018, more than 50 seniors were honored during The Dean’s Awards luncheon held in the Jordan Hall of Science Galleria. In a new study, physicists at the University of Notre Dame examined how the mechanical properties of an environment may shape the social evolution of microbial populations. The College of Engineering, College of Science, and Notre Dame Research are jointly celebrating the Alumni Association’s Annual Reunion with an event on Friday, June 1, 2018. The festivities will be held in the new McCourtney Hall and will feature fun S.T.E.M. themed food, drinks, and participatory activities. Patricia Clark and Paul Huber, faculty members of the Stavropoulos Center for Interdisciplinary Biophysics and the Biophysics Graduate Program, have received 2017-2018 Rev. Edmund P. Joyce, C.S.C., Awards for Excellence in Undergraduate Teaching. On Tuesday, May 8th, 2018 the Notre Dame Integrated Imaging Facility (NDIIF) will host its annual Midwest Imaging and Microanalysis Workshop at the McKenna Conference Center. The event will feature presentations from faculty across the region, including Purdue University, the University of Illinois at Urbana-Champaign, and the University of Michigan. This communication was found to vary across the colony and suggests that this bacterium may develop protective behaviors that contribute to its ability to tolerate some antibiotics. Mark Summe presents during 3MT®. The Notre Dame Integrated Imaging Facility (NDIIF) is pleased to announce two awards for best imaging publications for calendar year 2017. Sixteen collaborative research grants were awarded to Notre Dame faculty and research partners around the world. Notre Dame International hosted a special ceremony to honor and recognize the recipients for the 2018-19 international research collaboration grant cycle. The 29-hour live broadcast from Duncan Student Center will feature inspiring and entertaining Notre Dame stories from around the world through interviews, performances and appearances by celebrity guests. 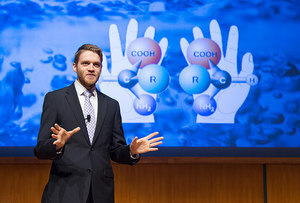 Cool temps did nothing to chill the heated competition among College of Science Shaheen 3MT competitors Tuesday night at Jordan Hall of Science. The fellowship provides three years of financial support in the form of $34,000 annual stipends and $12,000 cost-of-education allowances to the fellows’ graduate institutions. From engineering to biology, there is at least some concern of whether or not a given study’s results can be reproduced and therefore utilized in another study. To overcome this challenge, computational scientists from five research universities, including the University of Notre Dame, are developing a cyberinfrastructure and supporting tools that allow researchers to conduct and track their work – including data and methodologies – in a reproducible way. Beta-lactam antibiotics, including penicillin, are one of the most widely used class of antibiotics in the world. Though they’ve been in use since the 1940s, scientists still don’t fully understand what happens when this class of drugs encounters bacteria. Now, researchers at the University of Notre Dame have elucidated how an enzyme helps bacteria rebound from damage inflicted by antibiotics not strong enough to immediately kill the bacteria on contact. On April 9, faculty, students, staff, and the public are invited to attend the Harper Cancer Research Institute’s seventh annual Cancer Research Day. This flagship event highlights cancer research at the University of Notre Dame as well as other local cancer organizations. 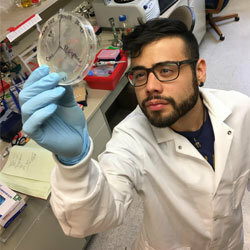 Tiny proteins found in the genomes of some types of bacteria are effective weapons against a wide range of other bacteria, opening the door for the development of new therapies in the age of antibiotic resistance, according to new research at the University of Notre Dame. Dramatic advances in data sciences, machine learning, and scientific computing, as well as the growing ability to collect scientific data, has led to a need for improved predictive modeling and design of complex systems. 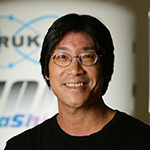 In order to better characterize the predictability of computational models and product performance, a new research center at the University of Notre Dame, the Center for Informatics and Computational Science (CICS), will develop mathematical, statistical, and scientific computing techniques to address the challenges associated with uncertainty quantification. 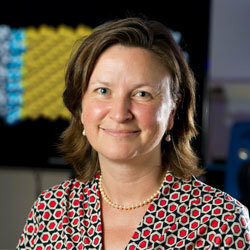 Patricia Clark, Rev. 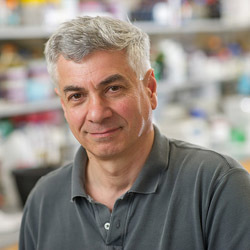 John Cardinal O’Hara, C.S.C., Professor of Biochemistry at the University of Notre Dame, has been awarded a $1.1 million, four-year grant from the W. M. Keck Foundation to develop an innovative approach to replicate in test tubes a universal component of protein folding within cells. At a few billionths of a meter, a nanopore is too tiny to see and too tiny to image easily. These miniscule cavities, when created in synthetic materials, are incredibly powerful. One of Notre Dame’s research groups is among the earliest to investigate electron transfer reactions inside nanopores, and therefore was invited to share their insights in a perspective paper published in ACS Central Science. Faculty from the University of Notre Dame will present their research at the Walther Cancer Foundation Symposium on Friday, Feb. 2 to Saturday, Feb. 3, 2018. The two-day event is hosted by the Harper Cancer Research Institute (HCRI) and will take place at the Eck Visitors Center. 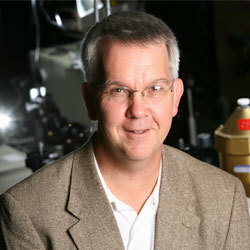 Alan Seabaugh, Frank M. Freimann Professor of Electrical Engineering, has been named the director of the University of Notre Dame’s Center for Nano Science and Technology (NDnano). As the new director, he will lead a center that supports more than seventy NDnano-affiliated faculty members from across nine departments in the Colleges of Engineering and Science to grow the scale and stature of the University’s nanotechnology research efforts. Research completed at the University of Notre Dame that tracked the maturation of the frog oocyte to an egg, followed by fertilization and progression to the two-cell embryo, provides a valuable foundation for developmental biologists who study the earliest stages of animal development. The graduate joint annual meeting of the College of Science and the College of Engineering (COSE-JAM) drew 45 poster presentations and 14 oral presentations during the event in Jordan Hall on Friday, Dec. 8. 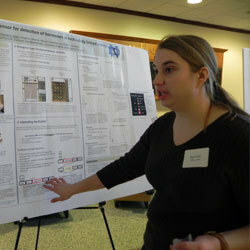 The event, similar to the popular undergraduate College of Science Joint Annual Meeting held each year in May, provides graduate and postdoctoral students the opportunity to present their research to their peers as well as to undergraduate students and faculty.